Caught Driving Whilst Disqualified? BA10, BA30 Endorsement? If a person has been convicted of driving or attempting to drive while disqualified and has a BA30 or BA10 driving licence endorsement on their driving licence they will likely see an increase in their motor insurance premiums as a convicted driver who has been previously disqualified from holding or obtaining a driving licence. Our panel of specialist insurers can help people find an affordable insurance policy if they have previously been disqualified from driving and have motoring convictions, previous driving bans, driving licence endorsements and/or penalty points. We allow convicted drivers to compare insurance quotes in order to help them find a cheap deal on their motor insurance. Any person who drives a motor vehicle on a road of a particular class that that person has been disqualified from holding or obtaining a driving licence for, by order of a court of law, is guilty of a criminal offence. A police constable in uniform can arrest, without a warrant, any person driving a motor vehicle such as a car or van or riding a motorcycle on a road, that they have reasonable cause to suspect of being disqualified from holding or obtaining a driving licence permitting them to do so. Driving whilst disqualified is an offence which is triable summarily in England and Wales, this means a person can usually only be convicted and sentenced for this offence in a magistrates court as opposed to a crown court. However, if a defendant is charged with a indictable offence in conjunction with this offence then they can be tried for this offence at crown court. In Scotland, driving while disqualified is an either way offence which can be tried either summarily or on indictment. England & Wales: The maximum sentence a person can receive for driving whilst disqualified is 6 months imprisonment and/or a fine of £5,000. Any person convicted of driving whilst disqualified will also receive a driving ban that extends their current driving disqualification or if no disqualification is imposed, 6 penalty points on their driving licence. Penalty points for this offence will remain on a persons driving licence for 4 years from the date the offence was committed. Scotland: The maximum sentence a person can receive for this offence if their case is tried summarily in Scotland is 6 months imprisonment and/or the maximum statutory fine. If their case is dealt with on indictment the maximum sentence that can be imposed is 12 months imprisonment and/or the maximum statutory fine. NOTE: An offender convicted of this offence will always have at least one relevant previous conviction for the offence that resulted in disqualification. The starting points and ranges take this into account; any other previous convictions should be considered in the usual way. The court must consider whether to give credit for time spent on bail in accordance with section 240A of the Criminal Justice Act 2003. For more information on sentencing guidelines, fine bands, sentencing for multiple offences and ancillary orders please visit Sentencing Council, Magistrates Court Sentencing Guidelines [online]. 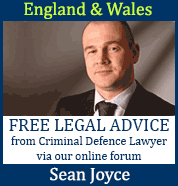 Available from https://www.sentencingcouncil.org.uk/the-magistrates-court-sentencing-guidelines/. ©Crown Copyright 2019.